Each new player at Sky Vegas can earn a Welcome Bonus of up to £150. The amount received is based upon the player's activity level during the first month of play. To begin, new customers must enter the promotion code (VEGAS150) when opening an account. If at least £20 is wagered within three days, a free £10 in bonus cash is awarded. Those who bet at least £1,000 within 30 days receive an extra £40 free. And if £3,750 is staked within 30 days, a bonus of £100 free is awarded. This promotion applies not only to new players who have never registered an account with Sky Bet, Sky Poker, or Sky Bing, but also those customers who have but are new to Sky Vegas. The BSkyB Group has been providing direct-to-consumer satellite television throughout the United Kingdom since 1989. It has become a trusted brand in over 10 million homes. Today its online casino operation, Sky Vegas, is tied into the broadcast system so that subscribers can play casino games on their TV screens, without a computer or mobile phone interface. 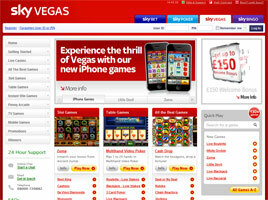 The Sky Vegas casino web site is also linked to Sky Poker, Sky Bingo, and Sky Bet, for a complete suite of gaming opportunities. The company has made it clear that it is on a mission, making technology convenient for everyone and putting viewers in control, as it seeks "to entertain, excite and inspire customers with a great choice of high-quality content". Sky Vegas offers dozens and dozens of Instant Play games to choose from. Because no download is necessary, players can leap right in. Clicking on the tab marked "All the Best Games" will bring up a page of the newest and hottest slots and table games. Another click pops up the game of your choice. It's just that easy. And because Free Play mode is available, games can be tested and evaluated prior to registration and deposit. Among the many options on Sky Vegas are classic 3-reel 1-line slots, the latest 25-line Monopoly and Marvel Superhero video slot games, 3-D games like Cubis, and a wide variety of Instant Win games, such as Pachinko, Bejeweled, Slotbox, and Chain Reactors. Eleven different progressive jackpots are on offer, and the Penny Arcade section provides inexpensive fun for everyone. The table games area is well stocked, from England Blackjack to the most lifelike virtual roulette tables available - some 19 games in total. Multi-hand card games, new dice games, poker keno, and Texas Hold'em Bonus are just a few of innovations that have been recently added. For video poker enthusiasts, there is a 50-hand game of Jokers Wild. Sky Vegas has added 10 games to its list of TV-accessible casino options. There is Blackjack, High Stakes Roulette, and Poker Keno, plus seven different 5-reel slots. All it takes is a Sky TV account and a television remote control device. Subscribers simply press "interactive" on the Sky Remote and then number 9. The Sky Vegas Games section will appear. As soon as a Sky Vegas user ID and PIN are entered, the play begins. Another recent addition to Sky Vegas is its Live Dealer component, with Blackjack, Roulette, and Baccarat. Vivacious young female dealers are streamed to the computer screen in real time, and they are available to talk to in chat mode as the games progress. Among other promotions, an additional £1-£150 No Deposit Bonus is also available to new members. Everyone newly joining who enters the promo code (VEGAS150) gets a free £1 bonus within 72 hours; then, every day two players are chosen at random to receive either £50 or £150 in additional free play. Another popular Sky Vegas promotion that applies to all customers is 25% Cashback on net losses on specified days; the refund applies to selected games. And monthly promos are offered, too, via e-mail and through the Promotions tab of the web site.